551 tickets left! Available For 34 More Days! Support Carolina Ballet and enter to win Odile's one-of-a-kind necklace. The winner will be randomly drawn on June 5, 2019. 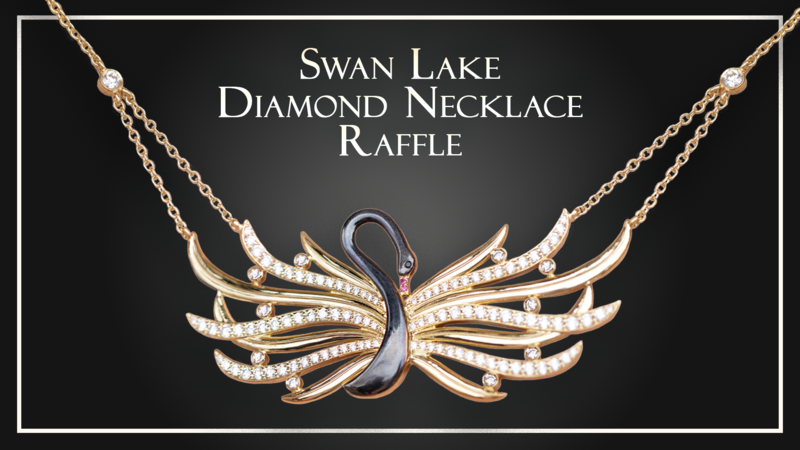 Bailey’s Fine Jewelry has partnered with Carolina Ballet to create a custom-designed necklace inspired by the Ballet’s upcoming production of Swan Lake. The necklace was designed and handcrafted in Bailey’s workshop by custom designer Rich Nobrega and will be worn by a Carolina Ballet principal dancer at each Swan Lake performance, May 16-19, 2019 at Raleigh Memorial Auditorium. Carolina Ballet offers $25 raffle tickets that give participants a chance to win the one-of-a-kind necklace. All raffle proceeds will benefit Carolina Ballet’s Creative Capital Fund, which helps the Ballet continue to expand its repertoire by creating new works, re-staging the classics with rich costumes and scenery, and increasing the number of programs featuring live music. Raffle tickets are available from March 29 until May 29, 2019. The necklace is made in 18-karat gold with 1.3 carats of pave diamonds and features black diamond and ruby accents. The retail value of the necklace is $6,675. Preview the necklace in person at our Monet Impression performances, April 11-14, 2019, at the lobby of Raleigh Memorial Hall. Must be 18 years or older to purchase a raffle ticket, and be a resident of North Carolina. Raffle ticket purchases are non refundable and not tax deductible as a charitable contribution. All IRS and state tax requirements must be satisfied by the winner. Carolina Ballet, Inc. will comply with all applicable tax requirements, including reporting and withholding requirements. The required Federal withholding rate (25%) is applied to the Fair Market Value of the prize and must be collected by Carolina Ballet, Inc. prior to the winner's receipt of the prize. Tickets can be purchased online only for $25 each. They may not be purchased with cash, check, nor via mail. Carolina Ballet and Bailey's Fine Jewelry employees are not eligible to participate. The Necklace is not redeemable for cash or any other value. The raffle will begin at 7 am on Friday, March 29, 2019 and will conclude at 7 pm on Wednesday, May 29, 2019, or when all 800 tickets are sold, whichever occurs first. The drawing will occur on or before the end of June 5, 2019. All tickets and winnings are non-refundable, and non-transferable. Winnings cannot be resold and cannot be replaced if lost, stolen or destroyed. Financial information about Carolina Ballet, 501(c)(3) tax-exempt organization, and a copy of its license are available from the State Solicitation Licensing Branch at 1-888-830-4989. The license is not an endorsement by the State.